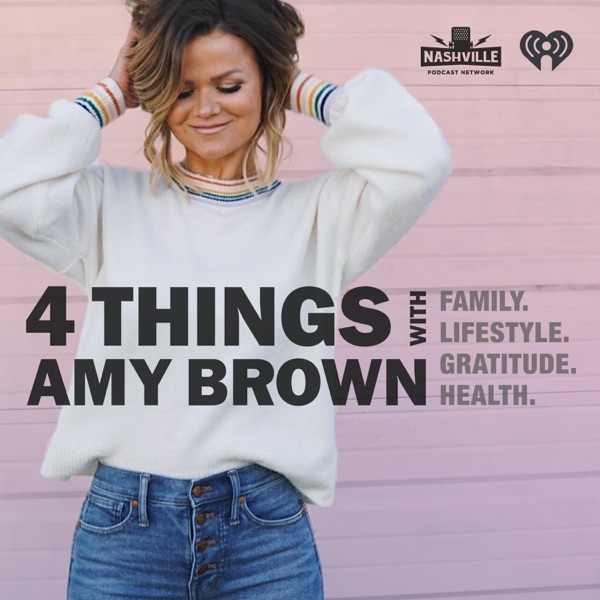 Join Amy Brown as she chats about “4 Things” each episode that she practices to promote an overall healthy well-being and maintain an attitude of gratitude, which she is trying to instill in her newly adopted children from Haiti while juggling the crazy schedule of a working mom! Tune in to find ways to sprinkle joy, self-care, and giving back into your life too! Inspiring Quotes. Skincare Tips. Say Hi To People: It Could Change Your Life. Game Changer Pancake Tip. #14: Benefits of Placebo. Dogs for Warriors. IV Health + Wellness. Boss Babe. #13: Husband. Good sleep hygiene. Are you a casserole or a spoon? Microblading. #12: Huddled Over Grace. Positive Affirmation. The Perfect Red Lips. Detox Smoothie. #11: Weird ways to de-stress. Water like a plant. Shave your face. Table time. #10: Crying Is Good. Weights Make Pretty Muscles. Homemade Deodorant. Protein Bars. #9: Bobby Bones. Celery Juice. Self-Tan Successfully. Plogging. #8: Period Talk. Hot Lemon Water. Learning About Racism. Jack Ryan. #7: Make Your Bed Like a Navy SEAL. Realistic Health Goals. Budget for Freedom. Self-Care Tips. #6: One Year Adoption Anniversary. It's Cool To Track Your Steps. Breast Cancer At Age 31. Cinnamon Rolls & Sausage Gravy. #5: Taking Mom Home. Gwyneth Paltrow Arms. Haitian Foster Families. News About Dry Shampoo. #4 - Nashville Beauty Girl Advice. The Starfish Story. Eating Organic. Marriage & the Military. #3: Stop Snoozing. Ballin’ on a Budget. Diet Soda Problems. Vocal Rest. #2: Microwaves. Holiday Health Tips. Leopard Print. No Joy Without Gratitude. #1: Superwoman Pose. Unanswered Prayers. Gratitude & Health. Protein Pancakes.